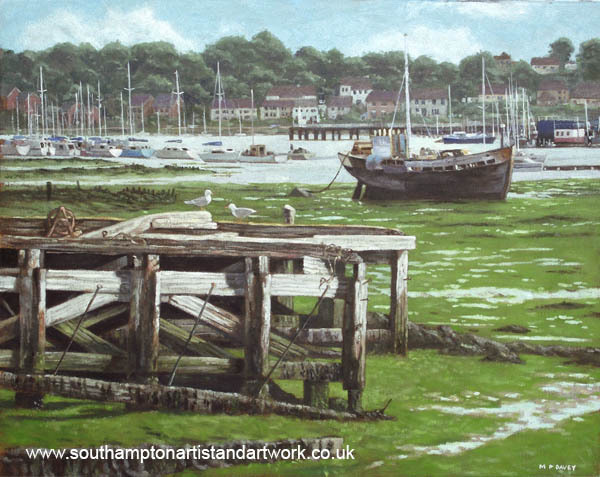 This landscape painting portrays a well known view from the Northam Bridge at Northam, Southampton, looking down the River Itchen in the direction of the docks and Solent. Here the tide is out and exposes a sea of wrecked boats of all ages and sizes. I was drawn to the interesting things that the location has to offer that would make an interesting painting, like the rotting hulls and the large area of green algae that covers the mudflats, the sea birds looking for food, and the distant features on the horizon. This is a popular location with photographers and artists, notably with the interesting textures seen on the landscape and the way that the scene is constantly changing in different light and weather conditions. Painted in oils on a 16" x 20" canvas during 2011.